Please note: this installation is closed in the winter. Dutch artist and designer Dré Wapenaar's multi-colored Pavilion in MASS MoCA's Courtyard C will be part of the MASS MoCA complex for years to come. 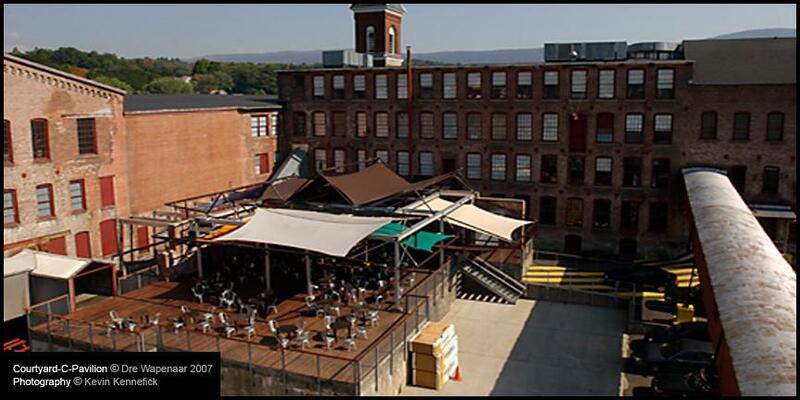 This outdoor social sculpture of overlapping canopies located in the center of the 14-acre complex provides a shady respite for daytime visitors and has become home to MASS MoCA's outdoor performances and concerts. "A Rotterdam-based sculptor who works primarily with tent-imagery, Wapenaar creates innovative spaces that foster dynamic social encounters and encourage new perspectives on familiar rituals. The artist has built a birthing-tent ( a water-filled sphere with a view to the sky ) and a bivouac for the dead – both featured in MASS MoCA’s 2004 exhibition The Interventionists. Past projects have included dewdrop-shaped nests that hang from trees for environmentalists and a concert pavilion for four grand pianos. Straddling the world of art and design, the artist’s tents can be found in schools, public squares and campsites, as well as numerous museum collections. 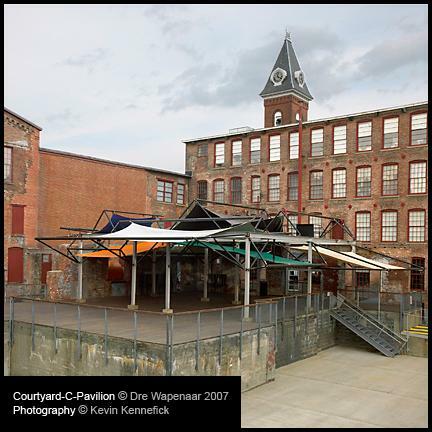 For MASS MoCA, Wapenaar has designed a pavilion for the museum’s central courtyard, the site of performances, films, and special events. New redwood decking and a series of overlapping, colored canopies provide an inviting sculptural environment for visitors both day and night. Supplying shade and protection from the elements, the structure extends the museum’s space out of doors, creating a more comfortable place to read, rest, and socialize while maintaining the courtyard as a lively site for cabaret and theater. The artist’s multi-use design has gone through three phases. Drawings shown here illustrate the rectilinear canopies of an early concept as well as the complex, organic silhouettes of the final work. The artist became increasingly interested in the historic mill structure as he worked through his designs, exposing the oil tank – which Wapenaar painted a bright “ Dutch” orange – on the north wall by cutting a new masonry opening, and juxtaposing his shaped canvases and rounded black-steel frames against rough-hewn brick and industrial I-beams. The renderings on view include a proposal for a raised seating pit featuring a custom-built wood stove to be built in a later phase." In association with NL: A Season of Dutch Arts in the Berkshires , the installation marks Wapenaar's second visit to North Adams. In 2004, as part of The Interventionists, he exhibited his Buckminster Fuller-inspired Birthing Tent (2003) and his Death Bivouac (2002). His inhabitable artworks use the tent form to suggest new social arrangements. NL: A Season of Dutch Arts in the Berkshires is coordinated by the Department of Press and Cultural Affairs at the Consulate General of The Netherlands in New York and Service Centre for International Cultural Activities (SICA) in Amsterdam. Initial funding for NL was provided by The Netherlands Culture Fund through SICA. Additional funding has been provided by the Fund for Visual Arts, Design and Architecture and the Mondriaan Foundation.